Buying a whole, enormous turkey can be daunting, or it can be a challenge to relish. This recipe from organic hero, chef and YouTuber John Quilter, aka the FoodBusker, is definitely the latter. Quilter suggests buying your turkey from Eversfield Organic. Lay the turkey legs on a thin layer of coarse sea salt in a deep non-metallic, flame-proof dish. Sprinkle with the thyme, fennel seeds, garlic, bay leaves and more salt to cover lightly. Leave for 12 hours to draw out the moisture. Wipe off the salt with a cloth but don’t rinse. Discard the salt, then return the legs to the dish. Preheat the oven to 140°C. Warm the duck fat gently in a pan, then pour the melted fat over the legs, making sure they’re completely immersed. Cover with baking paper so it touches the oil. Put the dish over a low-medium heat and bring to a simmer, then cook in the oven for about 3.5 hours until tender. Leave the legs in the fat to cool, then pull the meat off the bone and wrap the dish with cling film. Add 1 tsp of truffle paste to 6 tbsp mayo and mix together thoroughly. Add a good knob of butter to a frying pan and add the grated potato. Season and sprinkle with the thyme leaves. Brown on one side, flip and brown on the other, then cut out a round slice. In a non-stick pan, refry the confit turkey leg meat on a medium heat, until it is heated through and just beginning to lightly brown. Empty out onto kitchen roll, then transfer to a container and add 1 tsp of the fig jam. In the same pan, fry the duck eggs in metal rings. Once cooked, take them out and drain. On the toasted burger bun, scrape a slab of fig jam on to the bottom of the bun. Add the turkey and then the rosti. 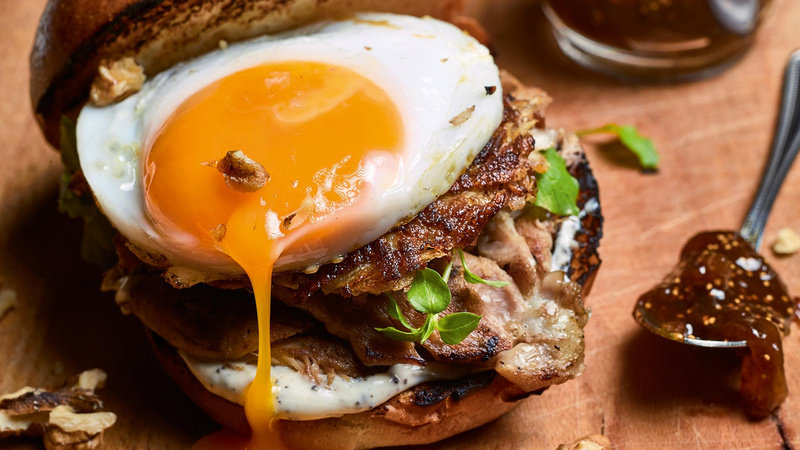 Top with the duck or chicken egg, walnuts, a splash of hot sauce and truffle mayo.